Bindi gets emotional with a surprise photo of her dad. Bindi gets emotional when her partner surprises her with a photo of her Dad. Get the tissues ready. Another two perfect scores wasn’t what made Bindi Irwin burst into tears. 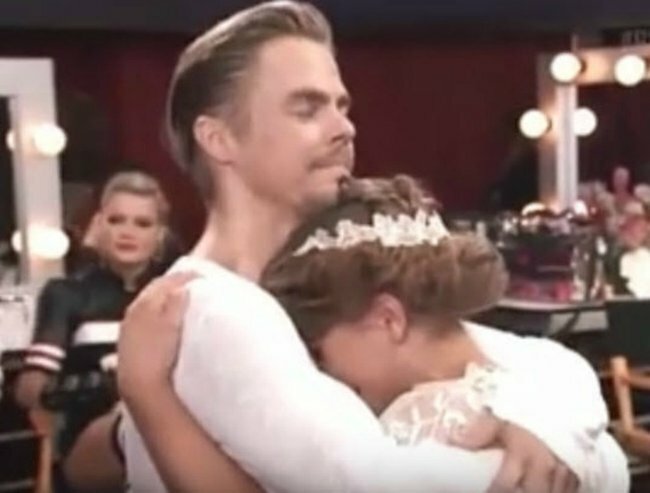 The Dancing With The Stars favourite had an emotional moment on stage when her dance partner Derek Hough surprised her with a photo of her late father, beloved Crocodile Hunter Steve Irwin, at the end of their routine. Bindi, 17, and her mum, Terri, weren’t the only two crying, with judges and members of the audience reduced to tears by the touching moment. The Aussie teenager embraced Derek, whispering “I love you” to him, before breaking down again backstage. Bindi said the entire experience had changed her life and followed the sentiment up on Instagram after the show. Her boyfriend Chandler Powell and brother Robert Irwin were also there to support her. No doubt they will be her biggest supporters in tomorrow’s grand finale. She will compete against Backstreet Boy Nick Carter and army hero Alek Skarlatos to take out the glitter ball trophy. And, after scoring 30 out of 30 for her quickstep and freestyle dance today, we think she’s a shoo-in.